Aisha Mohamed Masaud, 57, was married on November 18th, 1982. “I was 22 years old and my husband was 23. He was in medical school when we were married. He was apart of an Islamic organization that wanted to take down Gaddafi at Matiga base. I sensed that he was involved in something, but he never told me. He came home complaining everyday, that everything was getting worse under Gaddafi since he came to power. He was arrested on August 5th, 1990. I was pregnant with our fourth daughter. Our son was six and our two daughters were seven and two. It happened in the morning while he was getting ready for work. Military men came to our apartment, they put him in a car, then someone got in his car and drove it away with them. He was gone for eighteen days. One day, they brought him back to our apartment. They started searching the house for two hours. They took many of his books on politics and culture and all of his foreign magazines and newspapers.” “Journey to the Center of the Earth,” “The Count of Monte Cristo,” and “General Eisenhower” are a couple of his books that she kept of his. “He wasn’t cuffed, but you could tell that he had been from the marks on his wrists. He looked exhausted, hungry and very uncomfortable. He asked me to make tea and food for the soldiers. The soldiers wouldn’t eat anything before my husband. It was clear they were paranoid. My husband got his checkbook and started signing checks for me to cash. He was trying to comfort me and told me everything was going to be ok. We started going to the prison once a month, the 30th of every month to see him, but we never did. We cooked so many foods for him. I’d make things worse for us, so he could have better food. I found out later that the warden was taking the food and selling it. After 1996 we weren’t allowed to go to the prison anymore. In 2000, there was a man who was released from the prison. He asked his family to find us after he got out. He told us that my husband had been taking care of the sick in the prison. He told us that my husband was in group “A” and that he didn’t see him after the massacre. We received his death certificate in 2009; they took it to his parents’ house. Up to the recent revolution, I still had hope that he’d reemerge. He was a clever man, I had hoped he’d escaped and he was in hiding somewhere. When Tripoli was liberated, I knew without a doubt he was dead. Our joy for the revolution was different. The day our house was searched I told the men, you're not taking my husband from me, you're depriving this country of a great man." To which the security officer replied, "I know." Aisha Mohamed Masaud's husband was well read and well traveled and would bring his family keepsakes back from his trips. 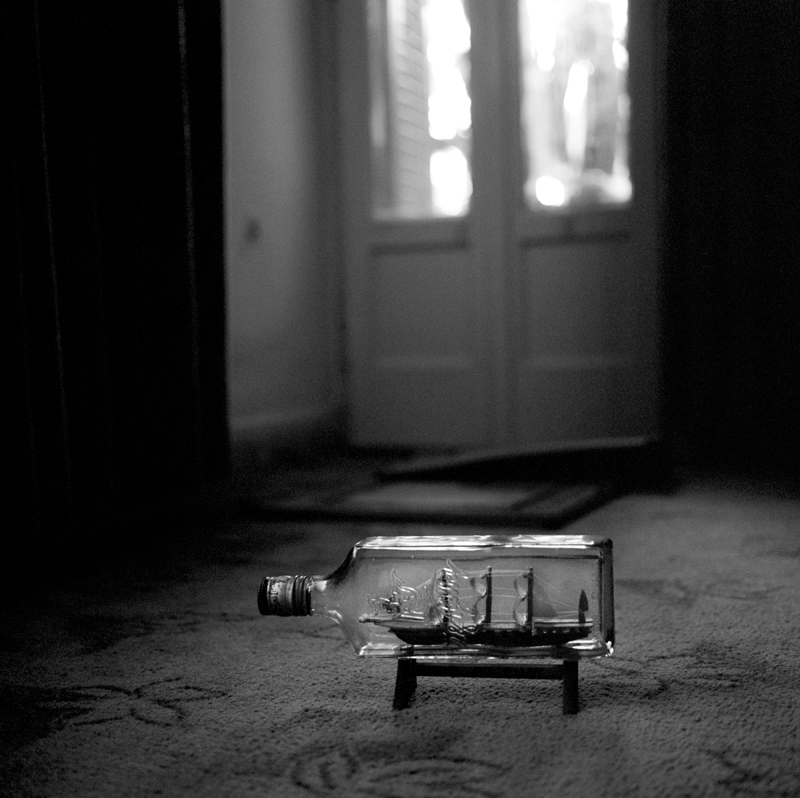 This ship in a bottle is one of the mementos that they kept of his and sits at their house in Tripoli, Libya on July 16th, 2012.